Use the 7-Step Inspection Method described in Section 2 to inspect your combination vehicle. There are more things to inspect on a combination vehicle than on a single vehicle, which are discussed below. Perform the following checks in addition to those listed in Section 2: Step 5: Do Walkaround Inspection. Check that fifth wheel is not so far forward that tractor frame will hit landing gear or cab will hit the trailer during turn. 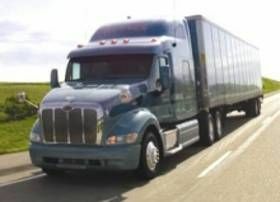 Perform these checks in addition to those in Section 5.3: Inspecting Air Brake Systems. Use the tractor parking brake and/or chock the wheels to hold the vehicle. Wait for air pressure to reach normal, then push in the red “trailer air supply” knob. This will supply air to the emergency (supply) lines. Use the trailer hand brake to provide air to the service line. Go to the rear of the rig. Open the emergency line shut-off valve at the rear of the last trailer. You should hear air escaping, showing the entire system is charged. Close the emergency line valve. 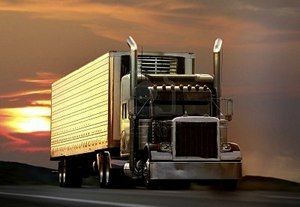 Open the service line valve to check that service pressure goes through all the trailers (this test assumes that the trailer hand brake or the service brake pedal is on), then close the valve. If you do NOT hear air escaping from both lines, check that the shut off valves on the other trailer(s) and dolly(s) are in the OPEN position. You MUST have air all the way to the back for all the brakes to work. Charge the trailer air brake system. (i.e., build up normal air pressure and push the “air supply” knob in.) Shut off the engine. Step on and off the brake pedal several times to reduce the air pressure in the tanks. The trailer air supply control (also called the tractor protection valve control) should pop out or go from “normal” to “emergency” position) when the air pressure falls into the pressure range specified by the manufacturer (usually within the range of 20 to 45 psi). If the tractor protection valve does not work correctly, an air hose or trailer brake leak could drain all the air from the tractor. This would cause the emergency brakes to come on, with possible loss of control. Charge the trailer air brake system and check that the trailer rolls freely. Then stop and pull out the trailer air supply control (also called “tractor protection valve control” or “trailer emergency valve”) or place it in the “emergency” position. Pull gently on the trailer with the tractor to check that the trailer emergency brakes are on. Which shut-off valves should be open and which ones should be closed? How can you test that air flows to all trailers? How can you test the tractor protection valve? How can you test the trailer service brakes? Study section 6.4 if you can't answer all of these questions. The following info only applies to trucks carrying multiple trailers. Remember: The tractor protection valve (red 8-sided knob in the truck) should pop out between about 20 and 45 psi. Activates the trailer emergency brakes. Keeps any remaining air in the tractor air tanks to prevent the tractor emergency brakes from engaging. Once air pressure drops to about 20psi, the tractor spring brakes (emergency brakes) will then engage and the yellow diamond shaped knob (also controls the parking brake) will pop out. Test tractor protection valve: Charge the trailer air brake system. (i.e., build up normal air pressure and push the "air supply" knob in.) Shut off the engine. Step on and off the brake pedal several times to reduce the air pressure in the tanks. The trailer air supply control (also called the tractor protection valve control) should pop out or go from "normal" to "emergency" position) when the air pressure falls into the pressure range specified by the manufacturer (usually within the range of 20 to 45 psi). Which statement about inspecting a combination vehicle is false? Landing gear is fully raised, no missing parts, not bent or otherwise damaged. What is a correct way to test the trailer emergency brakes? Test trailer emergency brakes: Charge the trailer air brake system and check that the trailer rolls freely. Then stop and pull out the trailer air supply control (also called "tractor protection valve control" or "trailer emergency valve") or place it in the "emergency" position. Pull gently on the trailer with the tractor to check that the trailer emergency brakes are on. The trailer air supply control (also called the tractor protection valve control) should pop out or go from "normal" to "emergency" position) when the air pressure falls into the pressure range specified by the manufacturer (usually within the range of 20 to 45 psi). What is the best way to test the Trailer Service Brakes? Many companies are no longer installing trailer hand control valves which is very unfortunate as this is really the only way to be certain the trailer service brakes are functioning properly. If your truck does not come equipped with a trailer hand control valve, test your brakes before you start driving on a major roadway. If you notice the truck struggling to stop, the problem most likely is with your trailer brakes and needs to be inspected.